While these warships are among the most powerful vessels afloat, they are poor sailors, being both slow and unresponsive. This is not a serious shortcoming because, armed with around 100 cannons firing 32-, 24- and 18-pounder balls on their three decks, they can fire a terrible and destructive broadside. They carry a crew of over 800 sailors, gunners and marines and have more artillery than most land armies. Their cost, however, is a drawback and few navies can afford to build or maintain more than a handful of them. Historically, first rates were never common, and hardly ever sent to overseas stations. 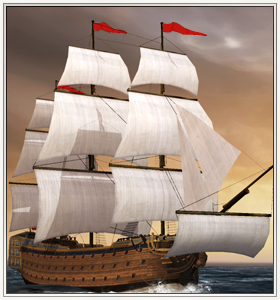 They existed purely to fight in set-piece battles, and were not used for mundane duties such as protecting merchantmen, policing the seas and hunting down privateers.